Napkin Ratings: As their menu says, “it can’t be good if you aren’t wearing at least some of it”. Burgers are one of the simplest meals someone can make – they can be dressed up or down and they can be made with almost any meat (or veggie) available – but they are also one of the easiest to screw up. Over the years I’ve eaten a few that literally blew my mind, many that were great and settled cravings and, some that were subpar, often because they were dry and bland. Being a fan of the build-your-own-burger (BYOB) idea, I’d tried Soda Jerks a few times and thought they did a decent job of fulfilling that niche. That is until The Burg (@TheBurg4St) opened on the 4th Street Promenade in downtown Edmonton. Situated in the old Ric’s Grill/Ric’s 104 St. Grill location inside the Historic Metals Limited Building at 102 Avenue, they’ve now been operating for about a year. While I had intended to visit much earlier, I didn’t make a point of going until the beginning of June. Throughout the last twelve months I had heard mixed reviews about the food, so even though I was really gung-ho about visiting when the restaurant introduced itself, that feeling eventually waned. Leave it to Groupon to give me that much needed nudge. Having to use my voucher, I asked my friend to join me there for lunch. The revamped restaurant interior – a lot more rustic than before. Since I had dined at the previous establishments many times before, seeing the space’s new incarnation as The Burg was a little shocking. The structure was virtually untouched, but it had been made to look a lot more spacious by knocking down some of the partitions that previously provided added privacy for the business clientele that used to be catered to. This place is now about being inviting. 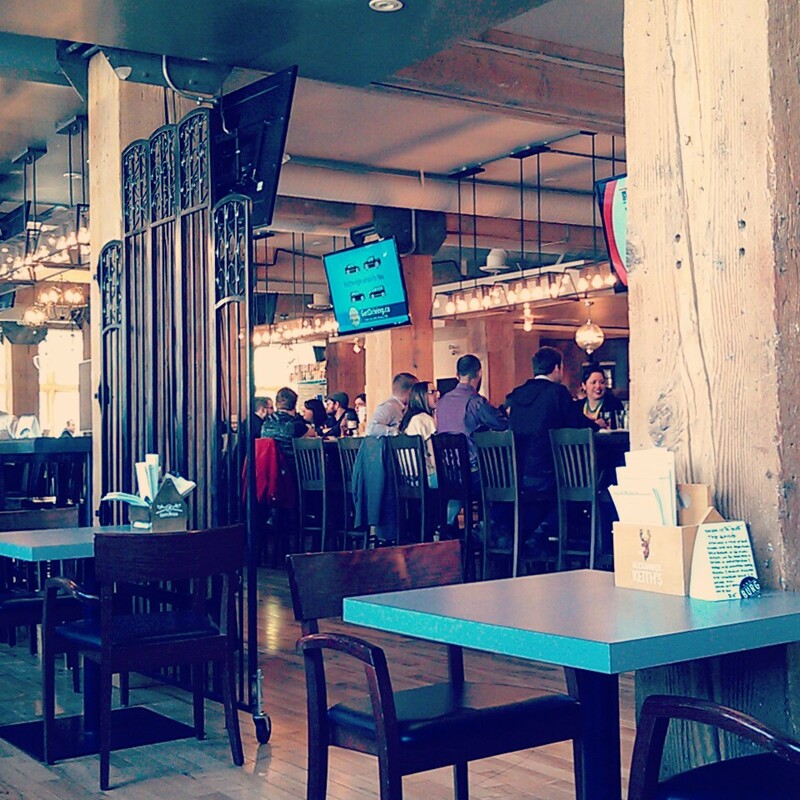 Meant to be a casual and social setting, it’s all wood floors, metal, rustic beams and open bulb light fixtures. The design gives it a welcoming atmosphere, and the tables can be rearranged to meet the needs of different sized groups or parties. I’m not sure about dinner, but for lunch you can seat yourself as menus are already at the table (like at Famoso), and a server will come by to check on you and take your order. I didn’t peruse the offerings prior to getting there, so I was surprised to see the selection of feature burgers in their seasonal menu. Those are in addition to the BYOB option and the Burger of the Month. Having read that the cost of a burger there was a bit exorbitant, especially when you take into account that the price doesn’t even include a side, I was happy to see that they at least give you the option of a Burger Combo lunch special that includes a basic burger and your choice of side for only $11. Our table neighbours went with that and it looked great. The menu rack and Burger of the Month card. Instead, my friend and I opted to share an order of the Mac ‘N’ Cheese Balls (or rather squares) to start. Cubes of elbow pasta covered in sharp cheddar, white cheddar and cream cheese sauce and then crusted with panko, fried and served with jalapeno queso dip, they were very good. I particularly liked the texture as the panko breading gave them a good amount of crunch that gave way to its cheesy center. These were actually quite similar to the version that I had back in May at The Phork. The Burg takes a less upscale approach by forgoing the truffle oil, and comparatively the spicy chili Ketchup at The Phork trumps the dip here because it packs a bigger punch with the taste. Still, I wouldn’t pass these up. The Lamb Provencal Burger – 4 Napkins – please bring this one back! For her main, my friend ate the Southern Fried Chicken Burger. I didn’t sample it, but she said it was delicious. The burger consists of a corn flake crusted thyme and onion scented ground chicken patty that is deep fried and finished with white BBQ sauce, leaf lettuce and tomato sandwiched between a toasted potato scallion roll. My love of lamb won out, so I ordered the Lamb Provencal (not available on the current menu), which is a lean ground lamb patty scented with Herb de Provence and mint, topped with grilled zucchini, roast red peppers, roasted garlic aioli and arugula in a toasted ciabatta roll. All I can say is that it was a flavour explosion. The meat was really juicy and the veggies were cooked until tender. 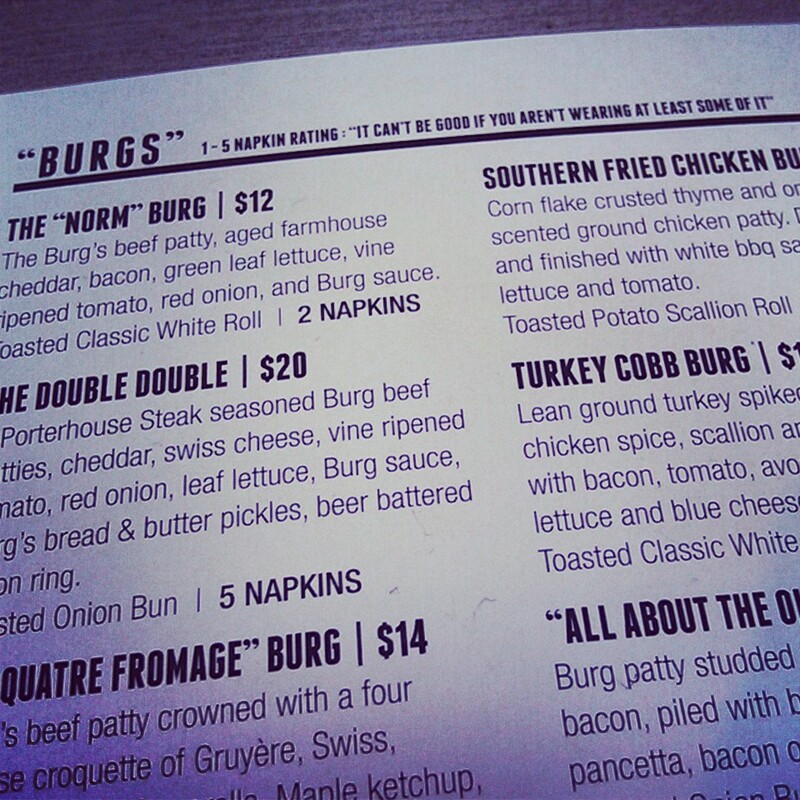 Both burgers were given a ‘4 Napkin’ rating (extremely handy, especially if you’re on a date!) on the menu, meaning they’re some of the messiest available at the restaurant, and I will attest that my friend and I had sauce dripping down our hands as we dug into our meals. Being that we had also devoured the appetizer, neither of us managed to finish our burgers, so we each packed up the last half for dinner that evening. The “Oh Canada” Bison Burger – eaten on my second visit! A shared order of sweet potato fries. Unfortunately, I’m not able to argue with what others have said about The Burg in the past. Every person has their own unique experience and opinion. This was my first of two visits and, so far, from my observations of the service received – our server was really attentive and came back when she said she would (as opposed to 20 minutes later) as we weren’t able to make up our minds when we initially sat down – and the quality of the food we had the pleasure of consuming on this particular occasion, I can say that I’ve now forgotten about those dated reviews that I had come across. Based on my own knowledge of The Burg, I would definitely recommend this as a hangout to my friends if they’re looking for a centrally located and satisfying burger joint.